Grand Central Publishing, 9781455595686, 368pp. 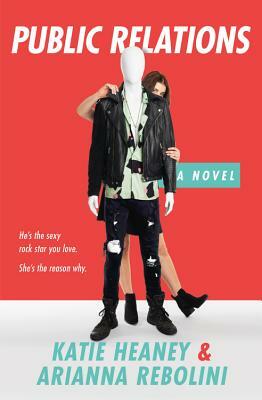 A smart and charming romantic comedy about a popstar and the publicist pulling his strings that Kirkus calls a "Cinderella for the modern age." As the faux-mance between Archie and Raya begins to rehabilitate Archie's faltering career, Rose finds his herself having unexpected, inconvenient and definitely unprofessional feelings for the crooner. But do late night texts and impromptu burrito binges mean he feels the same? In the end, Rose will have to decide whether to let her fantasy crush go, or to risk her reputation to be with the charming, handsome, scoundrel-y but sweet pop star she's grown to love. Arianna Rebolini is a writer and editor whose work has been published on in The Guardian, the Hairpin and and at BuzzFeed. She lives in Brooklyn. Katie Heaney is a senior editor at BuzzFeed whose writing has appeared in Cosmopolitan, Vulture, The Hairpin, The Awl, and Pacific Standard, among other places. She is the author of a memoir, Never Have I Ever, and the novel, Dear Emma. She lives in Brooklyn. Public Relations incisively captures the both hectic and structured world of celebrity PR. As devoted tabloid readers, self-imposed media critics and rom-com addicts, we eagerly devoured the scandalous relationship between bright-eyed Rose Reed and her charge, the not-so-unfamiliar Archie Fox (OK: rhymes with "Barry Miles"). If you keep tabs on celebs via Instagram and regularly refresh Oh No They Didn't!, you'll love Heaney and Rebolini's spin on an age-old tale of girl-meets-pop-star. make me wish real life celebrities were as fun to read about as Archie Fox.